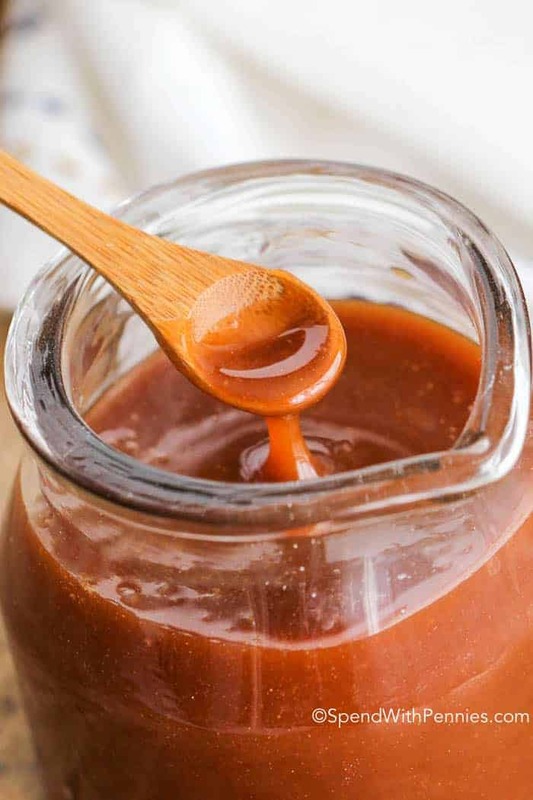 This easy Caramel Sauce is rich and amazing with no thermometer required! Drizzle this decadent treat on ice cream, cake or even apples! 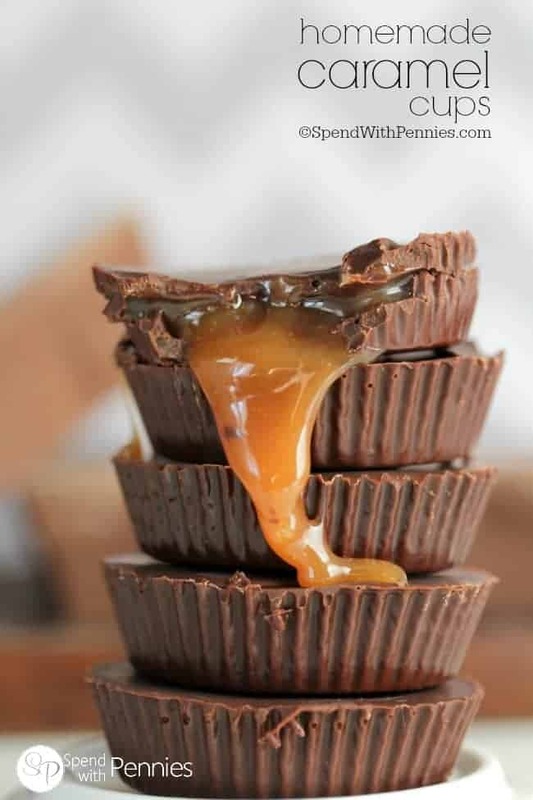 Caramel sauce is one of my favorite things! 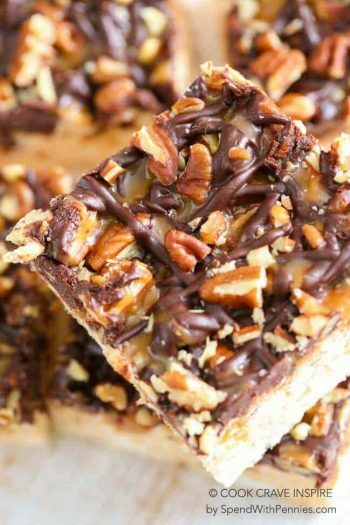 It’s perfect on pretty much any dessert and just has a totally decadent flavor. 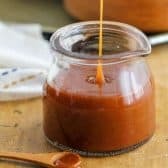 This easy caramel sauce is actually simple to make… the key is making sure you get the mixture the right amber color before you add in the cream. Just keep an eye on it because if it cooks too long you can get a bit of a burnt flavor… which I personally still love! It will slightly bubble up when you add the cream so make sure you are using a large enough saucepan to allow some extra space. Serve it on ice-cream, drizzle it over cake, stir it into hot milk or coffee… or eat it with a spoon, I won’t tell! 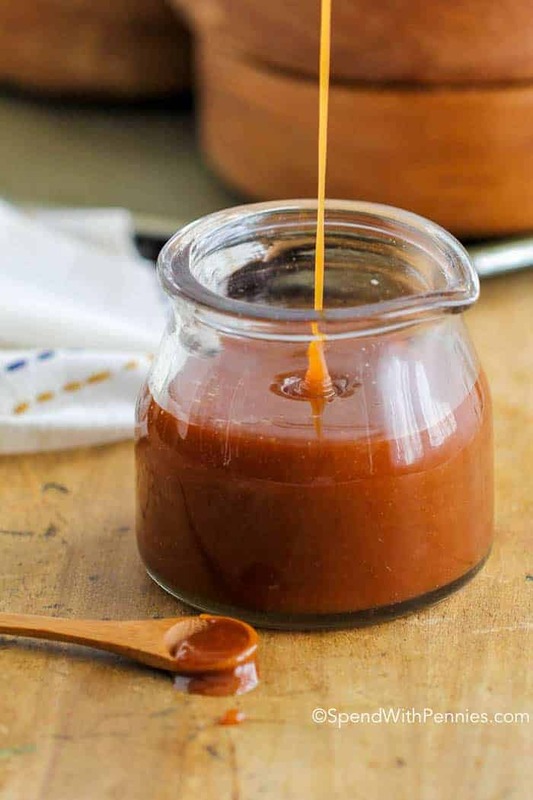 This easy Caramel Sauce is rich, easy & amazing with no thermometer required! 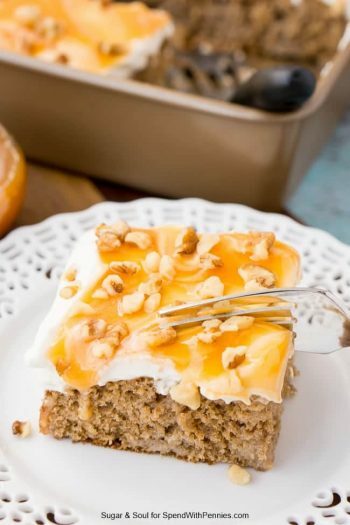 Drizzle this decadent treat on ice cream, cake or even apples! In a small saucepan, combine sugar, corn syrup & water. Bring to a boil over medium heat. Allow mixture to boil until the liquid reaches an amber color (approx. 15 minutes… but keep a close eye on it starting at about 10 minutes). Once the mixture has reached a nice amber color, remove from heat. While stirring, slowly pour in cream. Stir in remaining ingredients and enjoy! I’m going to try the Apple Pie Tacos from your site and would like to make this sauce with it. I have 1/2 & 1/2 do you think it would make a big difference if I used that instead of heavy cream? Janet, I’ve only made this recipe with heavy cream, but I do think it would work. It may have a little different consistency, but will still taste delicious. I’m not really a caramel person and decided to make this for my mom for Christmas because she loves caramel! 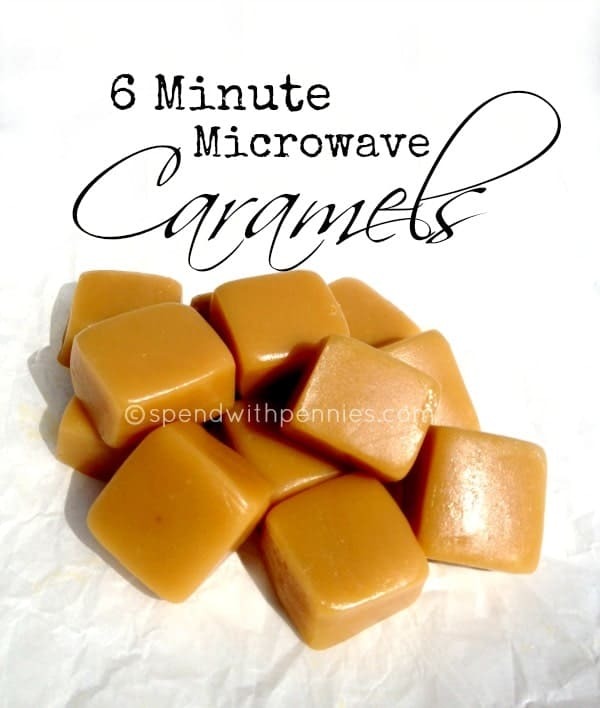 My daughter also loves caramel and raves about how delicious this recipe is!! Thank you!! 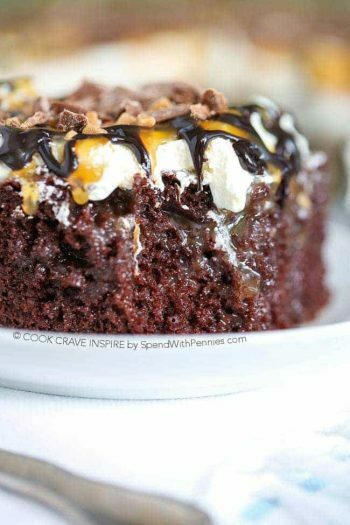 Do you stir the sugar mixture while it cooks? I do not stir the mixture. How long will it last in a mason jar? Giving them as Christmas gifts and want to make sure they last. Thanks! I just made this recipe today. Lately i’ve had a fascination with caramelizing sugar. It makes me feel like a really sophisticated in the kitchen. And people are quite impressed with it. 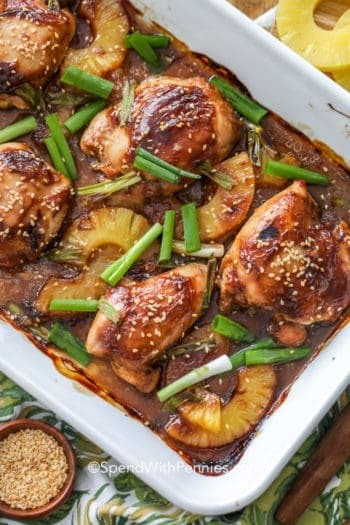 I found this recipe on Google after searching through various renditions of basically the same recipe. I pulled this off very quickly and easily. I mix the sugar, water and corn syrup a bowl and transfer to the pon being careful not to get any on the sides. I seem to have really good luck mixing my sugar/water/syrup this way. When I added the heavy cream the caramel seized up slightly and hardened in a few spots….but it was nothing that a vigorous whisk didn’t take care of. Thanks for the recipe! I am going to keep this one for future use! Can I use evaporated milk instead of cream? Thank you i n advance. I haven’t tried it but I’m sure it would work just fine! 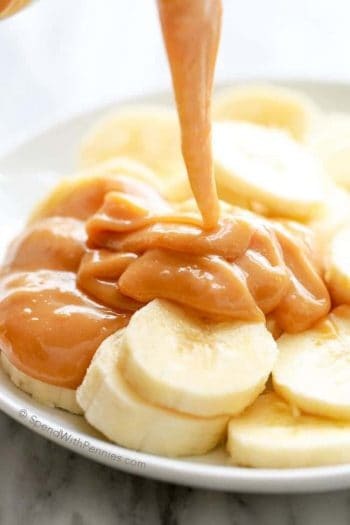 Delicious Carmel sauce and easy to make. Thank you! Should this sauce be refrigerated? I usually keep it refrigerated. I heat it on 50% power in the microwave for a few seconds to soften for serving. can I make enough for my coffee for the week and store it sealed at room temp? You can either refrigerate or leave it out at room temperature. What size pan did you use? I see it says a small saucepan but then it states use a big enough one that it doesn’t boil over. Thanks. I love your website! Many helpful hints and very, very good recipes! Thanks. I used a 3qt saucepan for this recipe. I’ve only made the recipe as written so I can’t say for sure. Are you using White corn syrup or Dark??? I personally refrigerate leftovers. I reheat them at 50% power in the microwave until warm.